Coluracetam (BCI-540) is a nootropic drug of the racetam family.Coluracetam (formerly known as MKC-231) was initially developed and tested by the Mitsubishi Tanabe Pharma Corporation for Alzheimer's disease. After the drug failed to reach endpoints in its clinical trials it was in-licensed by BrainCells Inc for investigations into major depression disorder (MDD), after being awarded a "Qualifying Therapeutic Discovery Program Grant" by the state of California.Findings from its Phase 2a clinical trials have suggested that it would be an ideal medication for co-morbid MDD with generalized anxiety disorder (GAD).BrainCells Inc is currently out-licensing the drug for this purpose.It may also have potential use in prevention and treatment of ischemic retinopathy and retinal and optic nerve injury. Coluracetam enhances high-affinity choline uptake (HACU) which is the rate-limiting step of acetylcholine (ACh) synthesis, and is the only known choline uptake enhancer to currently exist. 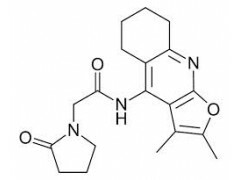 Studies have shown Coluracetam to improve learning impairment on a single oral dose given to rats which have been exposed to cholinergic neurotoxins. Subsequent studies have shown that it may induce long-lasting procognitive effects by changing the choline transporter regulation system.